Punched tin bronze finished lighting fixture. Mexican authentic and unique piece on this store. for you outdoor or indoor rustic decoration. Wired. 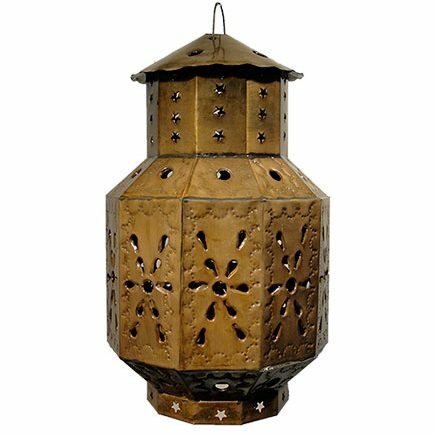 Punched tin bronze finished hanging lamp, this beautiful handcrafted piece is made with punched tin patterns by artisans in Mexico, Decorate your home or bussiness with this beautiful mexican lighting. We also have related items shown in the accesorie tab. Since each rustic tin fixture is hand crafted, color and finish may vary slightly from what’s pictured here. Chain and ceiling plates sold separately.